The court had previously stayed the case for an abbreviated three-month period and ordered the PTO to expedite its reexamination, but modified its order when plaintiff wanted "more time to respond to the PTO's initial rejection of its patents." "Obviously, the PTO cannot expedite its reexamination if the parties drag their feet. . . . [B]ecause [plaintiff] is apparently no longer in any hurry, neither is the court. This case will proceed when the PTO has fully reexamined the 'seamless expansion' patents and come to a final conclusion, a process whose length will be dictated primarily by the actions of the parties before the PTO. Accordingly, it is ordered that this case is stayed pending final reexamination . . . by the United States Patent and Trademark Office." The court denied plaintiff's motion to postpone trial for about 3 months and stay discovery to facilitate mediation. "This is one of many patent lawsuits filed in this court in which none of the parties have any genuine connection to this district or this state. Obviously, plaintiff’s decision to seek relief [here]. . . was motivated by the 'when' and 'how' of this court’s quick and strict procedures and policies for patent lawsuits. . . . 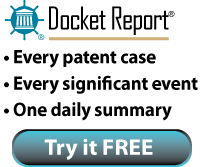 The judges in this court have been trying patent lawsuits for decades and the consensus is that a three month delay to accommodate a settlement attempt usually ends up being just a three-month delay, with the added cost of a failed settlement attempt, thus frustrating Rule 1 on every level." The court granted "as modified" defendants' motion to stay the litigation based on the PTO's initial rejection of all claims in three of the six patents-in-suit during reexamination. The stay order was modified in that it extended only until a date certain and ordered the PTO to expedite the reexamination such that it would be completed by that date. "The Court has no intention to stay these cases indefinitely. However, a modest stay may serve to resolve or clarify the issues in the cases to a significant extent, particularly if the parties are as interested in the efficient resolution of this dispute as they purport to be. Accordingly, this case shall be stayed [until a date approximately 3 months in the future]. The United States Patent and Trademark Office is ordered to expedite the reexamination of [the three patents-in-suit involved in the reexamination proceeding] and to advise the Court and the parties in these cases of its results prior to [a date approximately 3 months in the future]. The relevant parties in these causes shall likewise expedite their submissions, if any, to the PTO to facilitate timely reexamination; shall advise the PTO of this stay and the order for expedited review; and shall provide copies of this order to all appropriate personnel within the PTO." Res Judicata Bars Patent Claims That Could Have Been Asserted in Earlier Trademark Case Involving the "Same Technology and the Same Accused Products"
The court granted in part defendant's motion to dismiss plaintiff's patent infringement claim as barred by res judicata as to one of the patents-in-suit where plaintiff previously sued defendant for trademark infringement. "[T]he same technology and the same accused products are involved in both actions. Under these circumstances, the Court agrees that the trademark and patent claims would have formed a convenient trial unit. . . . The only reason the earlier suit did not contain patent allegations is because [plaintiff] chose not to make them. [Plaintiff] cannot avoid claim preclusion by choosing to omit its then-available patent claims when it brought the earlier action. . . . The same is not true with respect to [one of the patents-in-suit]. [That] patent did not issue until . . . over three months after the trademark action was filed." The court granted defendant's motion to strike portions of plaintiff's damages expert's report addressing "the Nash bargaining solution." "The Nash bargaining solution is a mathematical model that purports to define the most mutually beneficial outcome of a two-party bargaining scenario. After identifying the profits each party could expect without a deal and the surplus created by their cooperation, the Nash model allocates the value of the deal in two steps: each party first receives the same profits it could expect without a deal, and then the remaining surplus is divided evenly between them. The Nash bargaining solution relies on 'a few general assumptions' that 'idealize the bargaining problem.' . . . [Plaintiff's expert] glossed over the axioms underlying the Nash solution without citing any evidence to show that those assumptions were warranted in the present case. . . . The Nash bargaining solution has never been approved by a judge to calculate reasonable royalties in litigation, at least in the face of objection. . . . The Nash bargaining solution would invite a miscarriage of justice by clothing a fifty-percent assumption in an impenetrable façade of mathematics. . . . No expert testimony based on the Nash bargaining solution will be admitted." The court granted plaintiff's motion to dismiss defendant's declaratory judgment counterclaims after the parties agreed to a judgment of noninfringement, reserving the right to appeal the court's claim construction. "[Defendant] suggests that [plaintiff's] avowed reservation of its right to appeal this court's claim construction, and the accompanying specter that the Federal Circuit or the Supreme Court could vacate the non-infringement judgment, is enough to make a 'definite and concrete' dispute over the [patent-in-suit]. To accept [defendant's] position, the court would have to find that its claim construction is likely erroneous, and, therefore, tacitly abandon that ruling. The court will not do so." Judge Ward's Announced Retirement "Shifts the Private and Public Interest Factors More in the Direction of Transferring Venue"
Defendant's motion to transfer venue of plaintiff's infringement action was granted even though defendants waited 17 months to file their motion. "[T]hough not commendable, under the unique facts of this case, the Court holds that the delay is not sufficient for this Court to keep the case in the Eastern District of Texas. The timing of the undersigned's announcement of retirement is important in considering [defendant's] delay. . . . [Defendant] filed this motion to transfer venue three months after learning of the undersigned's retirement. . . . [T]he undersigned's announcement of retirement shifts the analysis of the private and public interest factors more in the direction of transferring venue, so it is reasonable that [defendant] may have decided to file the motion to transfer venue only after learning of the undersigned's retirement." The court granted defendant's motion to stay plaintiff's qui tam false marking action "[i]n light of the possible passage of legislation." "On June 23, 2011, the House of Representatives passed H.R. 1249. The Senate passed its version of the legislation (S.23) on March 8, 2011. Both S.23 and H.R. 1249 amend the false marking statute. First, these bills permit only the United States standing to sue for the per article fine. Second, these bills permit only those who have suffered competitive injury as a result of false marking standing to sue for compensatory damages. One provision included in the House bill, but not the Senate legislation, is new subsection 292(c) which states that no civil or criminal liability will arise if one marks a product with an expired patent number, provided that the patent actually covered the product. This legislation would apply to all false marking cases pending on or after the date of enactment. In light of the possible passage of legislation, I grant Defendant’s motion to stay until further order of court." Defendant's motion to dismiss plaintiff's infringement action for failure to state a claim was granted. "The Complaint alleges that 'as a result of its activities in connection with the television show "American Idol,"' the Defendant is infringing Plaintiff's patents. The Complaint does not allege which device, product, or method infringes Plaintiff's patents with any greater specificity. . . . Plaintiff fails to plead any information that identifies the infringing product or method or even the class or type of the product or method. The Complaint implies, but does not actually state, that Defendant's 'electrical systems' infringed Plaintiff's patents, but provides no details about which 'electrical systems' are at issue. . . . In fact, the only explicit allegations of infringement in this Rorschach-image-style Complaint are that Defendant infringed the patents at issue 'as a result of its activities in connection with the television show 'American Idol.'" Defendants' motion for attorneys' fees under 35 U.S.C. § 285 following summary judgment was granted. "Plaintiff’s claim interpretation found no support either in the plain language of the claims or the intrinsic record of the patent at issue and was therefore frivolous. The Plaintiff’s bad faith is further evidenced by the inadequacy of the investigation undertaken prior to filing this lawsuit. . . . [Plaintiff's opinion of counsel letter] fails to adhere to the standard canons of claim construction and is so lacking in any fundamental analysis or evidentiary support that the Plaintiff’s reliance upon this opinion as a basis for alleging infringement of Claim 1 was simply unreasonable and reflects a lack of good faith." The court granted defendant's motion in limine to exclude plaintiff's damages expert's "alternative analysis" theory in his supplemental report where he found the parties would agree on a $70 million lump sum royalty. "[Plaintiff's expert] posits that around $70 million, both [parties] would realize that they would be giving up too much if they held out any longer and would therefore agree to meet in the middle of the $0 to $138.7 million range. . . . The Court agrees that this analysis is not based in sound economic principles and factual predicates as required under the law. . . . [Plaintiff's expert's] vague statement on his reliance on 'other Georgia-Pacific factors and Business Realities considerations' are not tied to any factual predicates. It is unclear to the Court what else he relies on as part of these other factors to arrive at the $70 million number, apart from consideration of the 1% royalty rate." In denying plaintiff's motion to reconsider a stay pending reexamination, the court rejected plaintiff's argument that its experts "will be prejudiced by virtue of the stay because they have agreed to a patent prosecution bar until one year after resolution of the case. . . . This is not a new fact that could not have been brought to the Court’s attention earlier. . . . Second . . . [t]hat an expert faces a limited patent prosecution bar for the pendency of this litigation does factor into whether the Court should have issued the stay. Presumably, the restriction to which the experts choose to submit is more than offset by the benefit of generating substantial income by rendering expert services." The court found defendant in contempt for failing to disclose sales made to one customer before trial and imposed $500,000 in sanctions. "[Defendant] argues that these sales were irrelevant because these letter agreements contractually bound [its customer] from importing these bus converters into the United States. The Court rejects [defendant's] self-serving analysis on the relevancy of the sales data and letter agreements. First, a contractual obligation does not relieve a party of its discovery obligation, at least not until the party moves, and the Court grants, protection from its discovery obligation. . . . [T]o accept [defendant's] argument and analysis would be to condone a party's attempt to unilaterally contract out of its discovery obligations. Such a result would cripple and severely undermine this Court's integrity." The court found defendant in contempt for failing to disclose certain products in discovery until after trial and imposed $100,000 in sanctions. "[Defendant's] only explanation for this oversight is that 'one single manager blew it in his identification of Lineage custom products that might contain accused bus converter.' The Court finds [defendant's] explanation fails to address why it was reasonable to rely on one single manager's memory to fulfill its discovery obligations. . . . [T]he Court finds [defendant's] decision to rest its discovery obligations on one manager's memory was a willful choice to violate its obligation to conduct an adequate investigation and provide a full and complete disclosure. Additionally, the Court further finds that the willfulness of [defendant's] discovery violation becomes even more apparent when considering the magnitude of the sales that were inadvertently overlooked." The court denied defendants' motion in limine to exclude portions of plaintiff's damages expert's testimony. "As [plaintiff's expert] explains in his report, in 1996, [a third party and a defendant] entered into a license agreement in which [defendant] agreed to pay [the third party] a royalty equal to 25% of the manufacturing cost savings that resulted from [defendant's] use of the licensed technology. Rather than relying on the industry 25% rule of thumb rejected in [Uniloc USA, Inc. v. Microsoft Corp., 632 F.3d 1292, 1317 (Fed. Cir. 2011)], [plaintiff's expert's] use of a 25% apportionment factor is instead based on an actual, arms-length license agreement entered into by [defendant] -- who is a party to the hypothetical negotiation in this case." Convolve, Inc. v. Dell Inc., et. al., 2-08-cv-00244 (TXED July 8, 2011, Order) (Everingham, M.J.). To rely on royalty rates of third party licenses as a basis for his damages opinion, an expert must first establish the comparability of the licenses. "[I]f [defendant's expert] attempts to incorporate the royalty rates underlying the [third party] licenses into his testimony in front of the jury, [defendant] must first establish the comparability of licenses. It is not sufficient to state that both the [patent-in-suit] and the patents underlying the [third party] licenses cover hard disk drive technology. Rather, [defendant] must establish the functionality enabled by the [patent-in-suit], as well as the functionality purportedly covered by the licensed patent, and compare their economic importance." The court denied defendant's motion to dismiss plaintiff's declaratory relief claim for lack of subject matter jurisdiction. Defendant's CFO wrote a letter to plaintiff stating in part: "[I]t would appear that [plaintiff] is selling [a product] that is a direct copy of [defendant's] patented [product]. . . . [I]t is requested that [plaintiff] hand over all records of any sales of this [product] since January 15, 2006, the customers’ names and contact details, dollar amounts and any open orders, as well as who may may [sic] contracted for its manufacture. Failure to promptly respond to this very serious breach of our patent rights will not be tolerated." "Given [defendant's CFO's] statements requesting [plaintiff's] customer information, it would have been reasonable for [plaintiff] to be concerned that [defendant] planned to approach its customers and suggest that its product infringed [defendant's] patent. It also was reasonable for [plaintiff] to fear that a suit over the [patent-in-suit] was imminent. . . . This amounts to an actual controversy between the parties." The court granted plaintiff's motion to strike defendant's new noninfringement theory presented during cross-examination of plaintiff's infringement expert at trial. "[Defendant's] attorney asked [plaintiff's expert] hypothetical questions about this theory [at deposition], but did not disclose the reason for these questions. [Defendant] argues that since [plaintiff] has the burden to prove infringement, [it] had no duty to disclose its noninfringement theories. . . . Under [the court's Discovery Order], [defendant] was obligated to disclose its [new] theory. Moreover, if [defendant] intended its non-infringement or damages experts to testify regarding this theory, it was obligated to disclose the theory in its experts’ reports. . . . Instead of disclosing its [new] theory, [defendant] chose to lay behind the log and attempt to ambush [plaintiff] with this theory at trial. This Court does not tolerate such tactics and gamesmanship. The Court expects the parties to be forthcoming and work together to try the case on its merits. Having chosen not to disclose this theory that it has been aware of for several months, [defendant] is therefore precluded from using the theory at trial." Defendant's motion for a permanent injunction following a jury trial was denied. "While the [eBay Inc. v. MercExchange, L.L.C., 547 U.S. 388 (2006)] standard establishes that past harm is relevant to the irreparable harm analysis, an injunction is by definition a prospective remedy. In this case, the irreparable harm factor weighs against granting a permanent injunction because the 'irreparable' component of the injury that [defendant] alleges stems from [plaintiff's] past conduct, which allegedly 'shaped the market' and resulted in long-term customer loss. This harm would continue even if a permanent injunction were issued, and [defendant] makes no allegations of prospective lost customers or harms that are truly irreparable unless the court issues a permanent injunction. On the contrary, the court concludes that [defendant] would not benefit substantially from an injunction being issued at this stage, several years after [Plaintiff's] accused product entered the market." The court affirmed the magistrate judge's decision to deny defendant's motion to deem certain RFAs admitted. The RFAs asked plaintiff to "admit that '[plaintiff] did not Disclose [a certain prior art reference] to the United States Patent and Trademark Office in connection with the prosecution of [certain patent applications]'" and defined "disclose" to mean "bringing a patent, publication, application, or other information to the attention of the United States Patent and Trademark Office during the pendency of a patent application by listing the patent, publication, application, or other information in an Information Disclosure Statement. . . ." Plaintiff objected to the definition of "disclose" but answered that the prior art reference was not listed in an IDS. "While [plaintiff's] response splits a hair pretty finely, it had good reason to be careful. The word 'disclose' implies a duty to disclose. However, [plaintiff] itself had no such duty – it was only the people involved in the patent prosecution that had such a duty. . . . [Plaintiff's] admission that the people involved in the prosecution of this patent did not provide these references in an IDS does not also require [plaintiff] to imply that it should have provided them. [Plaintiff] admitted these statements to the extent that was appropriate and [defendant] may use that admission at trial. As such, [the magistrate judge] did not abuse her discretion when she found that these responses were appropriate." The magistrate judge recommended denying defendant's motion for summary judgment that plaintiffs' web-based database patent was invalid as indefinite. "[Defendant] contends that the 'engine for' claims are purely functional and should be construed under 35 U.S.C. § 112 ¶ 6. [Defendant] further contends that the term 'engine' does not connote sufficient structure to satisfy § 112 ¶ 6, nor does the [patent-in-suit] recite algorithms that perform the recited functions. . . . As a threshold matter, the Court declines to construe the 'engine' elements as means-plus-function terms. The claims reciting engines do not claim a 'means for' performing a function, which raises a presumption against construing the 'engine' claims under § 112 ¶ 6. . . . The fact that the claims define 'engine' in functional terms does not necessarily overcome the presumption that § 112 ¶ 6 should not apply. . . . [T]he term 'engine' conveys structure to one of ordinary skill in the art. Not only did the Examiner acknowledge that an engine is a 'software application' or software module, but [defendant] apparently agrees. . . ."